For almost 16 years of diets, taking pills, injections, meal replacements. It looked like I was doomed to fail in every one of them. 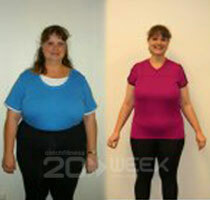 Lying in bed one morning listening to Classic Hits on the Radio I heard about the 20 Week Challenge. It took me about 4 days to realise that this is for me. I sent my photo and blurb on the last day before entries closed. After hearing that I was one of the five finalists, I was so happy. And to hear that I had won was just a inspirational feeling. Meeting my Personal Trainer Roger Symes for the first time just put me at ease in knowing that he was going to help me get through this and come out a different person. I even had an added bonus; Nick Ling a Dietician from City Fitness came on board with me and gave me an eating plan so simple and easy to following that I didn’t have to cook separate meals for the family and myself. Both Roger and Nick have played such an important part in this Challenge for me. I think the biggest difference that this challenge has done for me compared to all the other diets that I have tried is that I have had the most amazing time. Even been pushed to almost breaking point during training sessions with Roger, he always made me laugh and enjoy what I was doing. I could not have asked for a better Personal Trainer. He is there for me no matter what time of the day. Yes I have had quite a few lows that I have thought “why am I doing this”, “why and I putting my body through all this pain”. Having the support of family, friends and wonderful trainer just brings you out of that hole and makes you put aside all the dark patches and brings you into the light and concentrate on the goal ahead. What had helped a lot too is posting those bad days on Facebook and getting the feedback and support from others just makes you want to carry on. The differences in my body in just 20 simple weeks have just been amazing. The task of shaving my legs in bath is no longer a task it is a breeze. No more missing spots or trying to get one leg to rest of the side of the bath. I don’t suffer from headaches any more. I used to take pain killers at least 2 – 3 times week. I don’t think I have even taken them more than twice in 20 weeks and that is because I had tooth ache. Feeling the clothes get baggier and baggier and looking totally silly after a while really made me happy. Going shopping for small sizes just put me on a high. Realizing that I had dropped 3-4 sizes even before the 20 weeks was up just made me want to jump up and down. Even getting to the double digits on the scales put me on cloud 9. The comments from people around you and even those who hadn’t seen you in a few months just make you float. My fitness levels have changed so much. When I first did the stairs at Massey I could only do them twice for about 3 weeks in a row. Slowly that went to four and then eight. I could not believe it. They still kill me when I do them but not as much as they used to. The first time I swam I only did 21 lengths now the other day I did 62 in the same amount of time that the 21 took me and that was in a space of 2 weeks. I used to lose my breath after walking up a simple flight of stairs and now I can run up and down them with ease. I can go for a walk with the family and not get left behind. Keeping the same pace to my husband was a good feeling. Well the last 10 weeks I must say have been the hardest for me. Although I have accomplished so much, the weight loss has not been as much as it was in the first 20 weeks. I was ill for some time and I h staring at me all the time. I can walk with pride with my husband and children and not feel ashamed. My kids are now safe from been teased at school. This has been a big fear of mine. ad a foot injury which set me back. But when I look back to what I have achieved these minor setbacks are just that “setbacks” and thatis part of life. As long as you pick yourself up and dust off then mountains are mere mole hills in the long run. The support that I have had is just amazing. I think this has made all the difference’. At the start of the competition each of the two Classic Hits 97.8 entrants won a 20 Weeks of Gym membership Jolene’s was with City Fitness, and 20 weeks of treadmill hire from Elite Fitness, 20 weeks of training with personal trainer Roger Symes and an entry into the 20 Week Body & Lifestyle Competition. At the end, the winner of the Classic Hits comp won a Photography Package from Kim Stork Photography valued at $465, a relaxing foot soak, full body massage and an indulging scalp massage valued at $150 from Korrene Robinson Skincare, a three course dinner and drinks for two at ‘The Gallery, valued at $150 as well as a $100 bouquet and $50 voucher from Forget Me Not Flowers and from Red Hair – a designer restyle & colour, conditioning treatment , lash tint , brow tint and blow wave by one of their senior stylists valued at $250 and to top it all off, a skincare package from Hardy’s valued at $220.